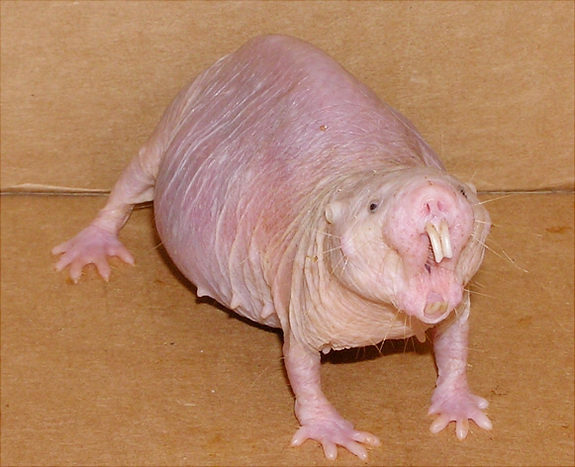 Naked mole rats aren’t moles, they aren’t rats, and a mere hundred or so hairs prevent them from being entirely naked. What they lack in looks, they more than make up for in strangeness. The East African mammals only grow to around three-inches long and spend almost their entire lives underground, but they possess a whole host of superpowers that have fascinated and baffled scientists for decades. This list digs deep into the weird, sometimes violent world of the naked mole rat. It’s a general rule of nature that large animals tend to live long lives, while their smaller cousins scurry off their mortals coils far sooner. Some species of whale are known to live for more than a hundred years, but three or four years would be considered a good run for an animal the size of a mouse or a shrew. Naked mole rats, which tip the scales at a mere four ounces, buck this trend in spectacular fashion. Almost no other mammals of a similar size make it into double digits, but naked mole rats have been known to live for thirty years or more. Even more remarkable than this is that they don’t appear to suffer the debilitating effects of aging in the same way that other animals do. While naked mole rats can and do sicken and die, they appear to be no more likely to do so at thirty years of age as at three years. While there is most likely an upper limit to how old a naked mole rat can potentially be, it might be well above anything we have seen in the animals so far. Around 7.6 million people die of cancer each year, making it one of the biggest killers worldwide. Almost all animals are vulnerable to the disease, with many species being even more susceptible than humans. Naked mole rats, however, appear to be almost totally immune. Scientists have gone to great lengths to force naked mole rats to contract cancer. Blasting them with radiation, smearing their skin with carcinogens, and infecting them with cancer-causing viruses have all proved ineffective. The naked mole rats just get on with their business completely unaffected. The cause of this remarkable resistance has been traced to high levels of a substance known as high molecular weight hyaluronan (HMW HA) found in the animals’ tissues. This sugary substance gives the naked mole rats’ skin its highly elastic quality, which comes in very handy in squeezing through narrow tunnels. That it also provides protection against cancer seems to be a happy evolutionary accident. It was believed that naked mole rats were entirely immune, since not a single animal, either in the wild or captivity, had ever been known to contract the disease. The recent discovery that two naked mole rats from two different colonies had developed tumors demonstrates that this isn’t the case. Quite what set these particular animals apart from all the rest of their kind isn’t yet clear. While naked mole rats may not be quite as impervious to the ravages of cancer as had previously been imagined, their resilience is still unparalleled in the animal kingdom, at least amongst mammals. It’s common knowledge that all mammals are warm-blooded; it’s also not strictly accurate. Warm-blooded animals possess the ability to maintain a regular body temperature independent of the external environment. There are a very few species of mammals that don’t qualify. One of the most striking examples is the Arctic ground squirrel, whose body temperatures drop to below freezing during hibernation. Not surprisingly, naked mole rats are another of the very few mammals to break from the norm. Unlike almost every other mammal, naked mole rats lack the ability to regulate their body temperature by themselves, making them effectively cold-blooded. This is both good news and bad news for the animals. Naked mole rats are unable to cope with large fluctuations in temperature. However, in practice this rarely matters. The tunnels where they live maintain a near-constant temperature throughout the year. If the animals do become too cold they huddle together for warmth; too hot and they retreat to the cooler depths of their deepest tunnels. Meanwhile they are no longer burdened with the need to provide the extra energy a warm-blooded animal needs to fuel its body. As a result naked mole rats can work longer, harder, and on far less food than other mammals could manage. With their remarkable metabolism, longevity, and resistance to cancer, naked mole rats are being closely studied by scientists hoping to unlock the secrets of these extraordinary mammals. Yet another avenue of research that might yield huge benefits is the naked mole rats’ apparent immunity to physical pain. In a 2008 study, acid was applied directly to the skin of several naked mole rats. Any other mammal would be in agony, but the remarkable rodents appeared not to be inconvenienced in the slightest. Burns, acid, and even the hottest of chili peppers don’t appear to cause the animals any pain. Curiously enough, naked mole rats do seem to possess the same pain receptors as other mammals. What they lack is the neurotransmitter that would allow the signals to be picked up by their brains. This renders them largely immune to many types of physical pain. So far as is known they are the only mammal to possess this ability. Physical pain is unpleasant, but it is often viewed as an evolutionary necessity. It’s pain that warns us when we are inflicting damage on our bodies, and we’ll go to great lengths to avoid it. Scientists were curious as to why naked mole rats didn’t need this incentive to avoid dangerous situations. It turned out that they did. Young mole rats appear to feel pain in the same way as other mammals. It’s only as they approach maturity that their immunity kicks in. The average human would be in trouble after just four or five minutes without oxygen. After ten minutes they would be at serious risk of death or irreversible brain damage. For naked mole rats the need for oxygen is considerably less urgent. Air is made up of around 20% oxygen, but in the crowded tunnels these animals call home it’s in much shorter supply. Anything lower than 10% would soon become deadly for humans, but naked mole rats can get by on as little as 5%. Even when deprived of oxygen entirely the naked mole rats have a remarkable survival trick. By entering into a catatonic state, they are able to survive for as much as eighteen minutes, recovering completely and with no ill-effects when oxygen is reintroduced. Naked mole rats have evolved a highly unusual means of accomplishing this feat. The usual glucose-based system of providing energy requires oxygen, so the naked mole rats switch over to a fructose-based system which doesn’t. Using fructose to produce energy is standard procedure for plants. In the animal kingdom, and certainly among mammals, it’s almost entirely unheard of. Nonetheless, by this means the naked mole rat is able to buy itself some time and keep its vital organs ticking over until the oxygen situation improves. Some species of mammal live solitary lives. Others form various kinds of social groups. Only mole rats live like in a society more reminiscent of insects. Naked mole rat colonies range in size from around thirty to more than three hundred individuals, and each of these fulfils a specific function. Workers spend the bulk of their waking lives digging, gathering food, and caring for the young. Meanwhile, the soldiers are tasked with defense of their territory, whether it be from predators or invaders from another colony. Above them all is the colony’s queen, who is distinguished from her subjects by her larger size, lighter coloring, and particularly aggressive nature. While the queen is alive and healthy, she secretes chemicals in her urine that prevent any other female from bearing young. Almost all of the males are sterile, with just a favored two or three permitted to mate with their queen. This unusual arrangement means that almost every member of the colony is extremely closely related, many of them so closely as to be almost genetic clones. The queen is more than just ruler of the colony; she is its mother. It’s common enough for insects to structure their society in this way, but it’s almost unique among mammals. A single naked mole rat colony can span the equivalent territory of six football fields. In addition to several miles of interconnected tunnels, the animals dig out large social areas, larders for storing the tubers that make up much of their diet, and shared toilets. Naked mole rats don’t store their poop in one place to keep it out of the way, but so they can easily locate it and put it to use. Each animal will periodically visit the latrine with the purpose of rolling around in the mess. While this behavior would be of serious concern in a human, for a naked mole rat it’s quite normal. Their poor eyesight makes it difficult for them to identify each other visually, so they instead rely on their keen sense of smell. With each naked mole rat sharing the colony’s unique scent, picked up via the latrines, it becomes an easy matter to tell friend from foe. When they aren’t covering themselves in poop, these unusual rodents will frequently eat it. The tubers they rely on for food are difficult to digest, so naked mole rat poop still contains high levels of nutrients. By eating excrement, they get two meals for the price of one. In 1842 the German naturalist and explorer Eduard Ruppell became the first Western scientist to document the existence of the naked mole rat. The strange appearance of the animal he encountered led him to suspect it might have contracted some terrible disease. It was, in fact, a perfectly ordinary naked mole rat. Ruppell did not know that its bizarre appearance made it perfectly adapted to its environment. The naked mole rats’ almost total lack of hair and saggy, wrinkled skin might not win them any beauty contests, but their near-nakedness makes it easier to keep parasite-free. It also allows them to roll around in all that poop without becoming a tangled mass of disease-covered nastiness. They are capable of turning 180 degrees in the tightest of tunnels; if they come under attack and there’s no time for such maneuvers they’re quite capable of running just as fast in reverse as going forwards. Their beady eyes are almost entirely useless; they instead make sense of their environment through a keen sense of smell, hearing, and sensory input from their large protruding incisor teeth. These teeth, which continue to grow throughout their lives, are not only used for eating, but also for digging tunnels and fighting. They can even be moved independently of each other, much like a pair of chopsticks. In the world of ants, termites, and bees, certain larvae are singled out to receive extra care and nourishment. The insect that emerges will be a queen from the first moment of the new stage of her life cycle. For naked mole rates there is no such royal birthright. Every female is born into humble beginnings, but each of them have the potential to become sole ruler of the entire colony. While the queen is alive and healthy she is the undisputed leader of the colony, but if she dies, shows weakness, or is removed, other females will attempt to claim the throne for themselves. This is a dangerous gamble in a high-stakes struggle. When the queen was removed from a colony at Brookfield Zoo in Chicago, three females fought a vicious battle for supremacy. The trio inflicted such serious wounds on each other that none survived. Where such a leadership bid is successful, the new queen’s hormone levels will rise, allowing her to breed and bear young. In an even more remarkable physiological change, the animal will increase in size. Her vertebrae will even extend to allow her to more easily carry her young. While no male can ever rise to become ruler of the colony, the more violent and ambitious ones have the potential to become one of the favored few permitted to mate with their queen. Upward social mobility in naked mole rat society is difficult and dangerous for both males and females, but it is attainable. There are more than eighty different species of mole rats, but naked mole rats are actually more closely related to porcupines, chinchillas, and guinea pigs. However, it is perhaps somewhat surprising that they have managed to survive and reproduce at all. Scientists have examined naked mole rat sperm and found it to be of exceptionally poor quality. It’s produced in low quantities, many of the individual sperm are deformed, and only between one and fifteen percent of the sperm can swim at all. Of these active sperm a mere one percent are relatively strong swimmers. Even then they travel at only 35 micrometers per second, which may be slower than the sperm of any other species of mammal. Despite the dismal quality of their sperm, which would result in infertility amongst any other species, naked mole rats have no difficulty in producing healthy young in substantial numbers. The queen will spend almost her entire life pregnant, producing litters of as many as thirty pups at a time, and will remain fertile even in her old age.